Adapter SOIC-8/DIL-8 200mil ZIF for SMD chips in SO-8 200mil case. Recommended for FLASH SPI 25x chips. 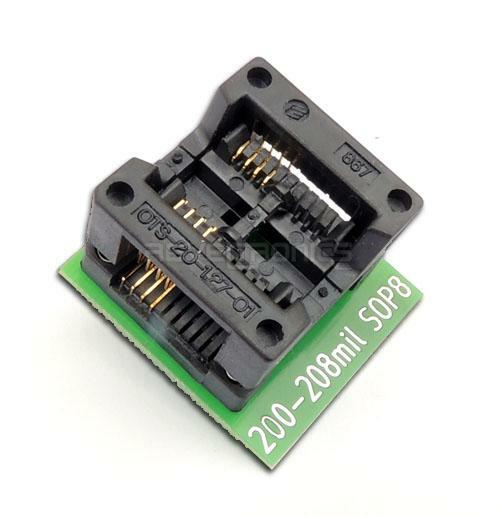 Adapter SOIC-8 (SO-8) -> DIL8 (DIP-8) 200mil is compatible with SMD 8-pin chips (SO-8 200mil). Characterized with high quality slim-type gold pins, thanks to adapter is useful with most ZIF and DIL/DIP sockets. Small dimensions guarantee compatiblity with most programmers.